Posted October 5th, 2017 by Capital Models & filed under News. We’re very lucky at Capital when it comes to regular clients that we get on with. Some we have worked with for many years and have developed happy, trusting relationships with them. These relationships between client and supplier cannot be bought or manipulated – it’s a slow grower, an investment, a chemistry! One such client we would like to put in the spotlight is Higgins Homes who we have worked with since April 2015. We have formed a partnership that has mutual trust and full understanding of the tasks in hand. This ultimately leads to realistic deadlines, openness, efficiency and work of the highest level. With our studio closely located to their London head office, they often visit our workshop and see the construction of their architectural models develop over a period of weeks. Towards the end of a project we encourage them to come and check the finer details, keeping us all focussed and on our toes! 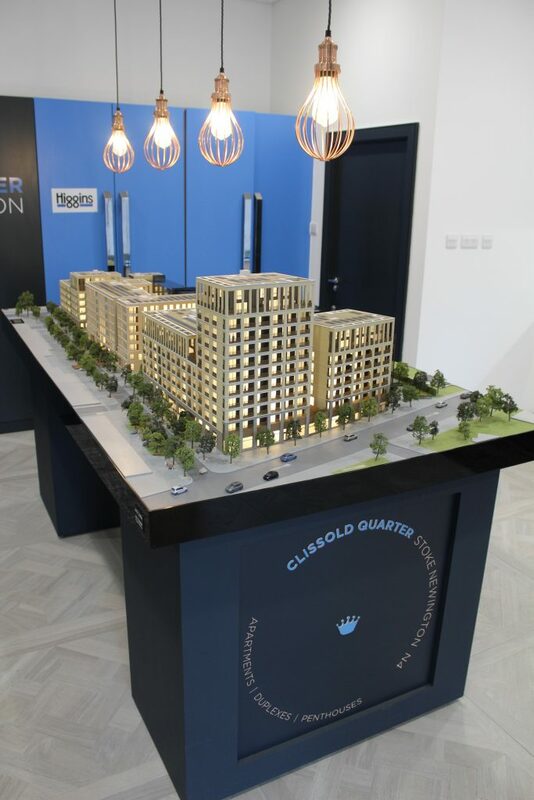 We have constructed models for three of Higgins Homes London developments over the last few years. These have been East Central in Clerkenwell, Clissold Quarter in Stoke Newington and the Oval in Camberwell. All these projects needed full architectural 1:75 and 1:100 scale models for full marketing capabilities. Working at this scale is interesting for our teams and involves as much detail as possible, which also challenges the senior model-makers. Each team is typically two or three people per model, encouraging team interaction, forming good working groups and keeping genuine interest and creativity flowing in the work place. Architectural model making is a powerful tool and can effectively communicate an idea or concept to all involved, whether that’s managers, architects, engineers, planners, contractors or sales. When put in the right hands and managed by good partnerships, a well-built 3D architectural model can be used over and over again for future projects, presentations and pitches. Our service to maintain and repair models gives our clients the option for this. We truly believe the models we produce help viewers to visualise a building, adding a sense of warmth and reality that ultimately gives an instant understanding of how a building will look on completion. The three Higgins Homes projects that we have recently worked on have been incredibly successful with two out of the three now fully sold out. We are proud that we have been able to contribute to winning projects, helping to obtain planning permissions, and in a round about way, aiding the construction process and the living environments that communities embrace today.